Because of a certain gambling aspect, Psyonix is steering clear of the marketplace. The popular Rocket League is jumping into the loot crate business but fear not, rocketeers. Developer Psyonix is aware of possible concerns. In an effort to fund its upcoming eSports prize pool, Psyonix VP Jeremy Dunham said via reddit that an announcement of the new system was scheduled for next month around the time of the Rocket League Championship Series. But Dunham said that the company will implement it in a particular way that should cut down on gambling concerns. "There will be no Steam Marketplace integration with crates," he said. "We are definitely aware of the problems related to third-party gambling in other games and we are not interested in taking that approach. ... It's actually a pretty cool system that we'll be happy to share detail about next month." 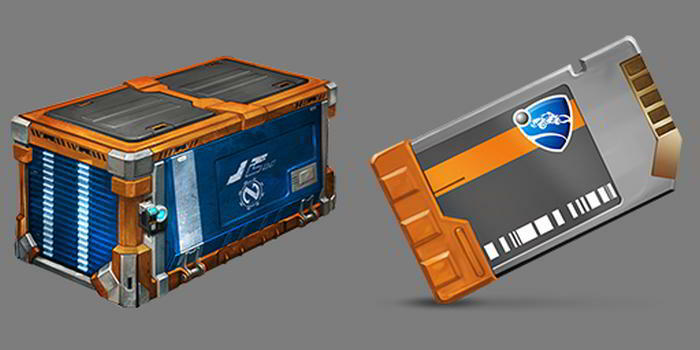 Dunham added that the crates will contain cosmetic content only, and it will not affect the current drop system at all. "We have a strict "Don't Sell Advantage" policy for Rocket League, and we're sticking with that." And any player not wanting to participate can hide the system entirely just by checking a box in the interface. The new crates also will not affect Psyonix's plans of free content such as arenas, modes and items, as well as the occasional paid DLC. News of the existence of the crates came when reddit user TheSergeantPunishment dove into the game's files. The crates themselves were addded in the Hoops update, while the keys apparently came in during the Neo Tokyo update, which included the cool Shacknews flag.